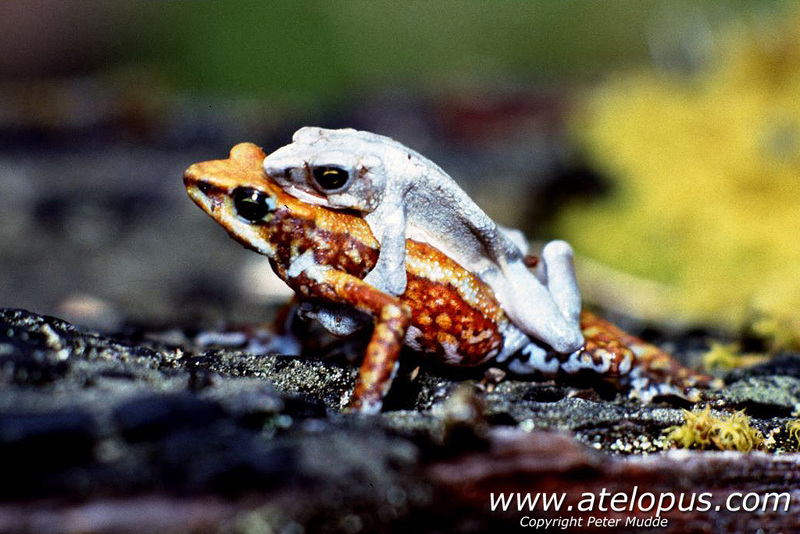 Atelopus chiriquiensis in amplexus. Population in Las Tablas, Costa Rica (1991). 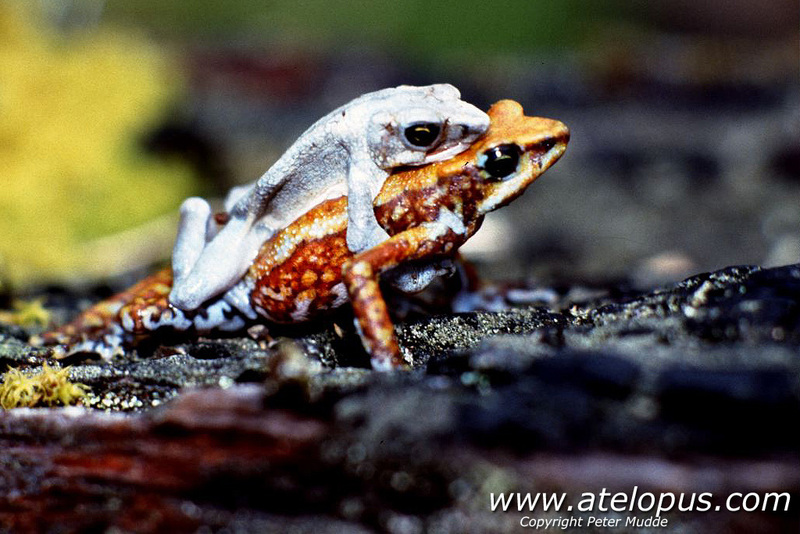 Atelopus chiriquiensis in amplexus (1991) Las Tablas, Costa Rica. 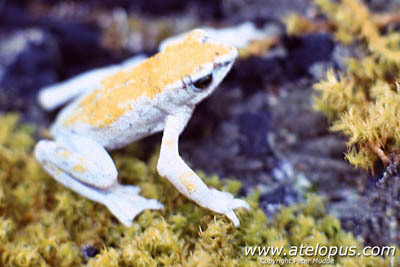 Atelopus chiriquiensis male in Las Tablas, Costa Rica in 1991. Atelopus chiriquiensis in amplexus. Las Tablas, Costa Rica in 1991. Native to the cool humid cloudforest in the Talamanca Mountain range from Costa Rica to Panama. The range of the species is within the protected areas of Parque Nacional Chirripó and Parque Internacional La Amistad. This species is found at elevations of 1400-2500 meter above sea level (asl). This species is considered most likley extinct. In Costa Rica the decline and probable extinction of this species has been linked to chytridiomycosis, which was confirmed in this species in 1993 and 1994. Introduction of predatory trout and a general habitat loss are threats to remaining populations. Climate change is considered to be a possible threat. The threat of chytridiomycosis means that successful conservation measures will probably need to include the maintenance of any surviving individuals in captivity. There is some variation in habitat selection between sexes. Males prefer areas near streams and females prefer a more shaded forest habitat, moving to the areas around the streams for breeding. Atelopus chiriquiensis tadpoles are gastromyzophorous, with 2/3 denticle rows, and resemble those of Atelopus varius. This species are higly variable in coloration. Males have a uniformly yellow, chartreuse, lime green or brownish red coloration. Males have sometimes patterns consisting of thin back reticulations, or fine dark vermiculations. Females are more variable in coloration and are rarely simular to the males in color. Many females have an orange or orange-red stripe, outlined in black, which begins at the snout and then splits into two stripes running down the sides of the dorsal pattern. Females sometimes have a broad black and red reticulum ventrally. Both males and females have an orangish or greenish eye color and sometimes they may even have an eye of each color. The iris is gold. Lips, K., Ibáñez, R., Bolaños, F., Chaves, G., Solís, F., Savage, J., Jaramillo, C., Fuenmayor, Q. & Castillo, A. 2010. Atelopus chiriquiensis. The IUCN Red List of Threatened Species. Peter Mudde, Netherlands. Photographs copyrighted and scanned from DIA-slides. 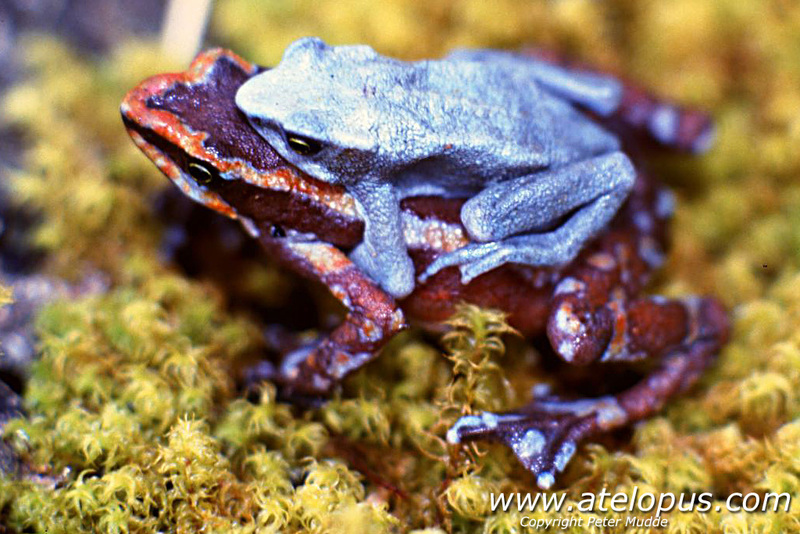 Atelopus chiriquiensis - Costa Rica. Photos taken in 1991. All copyrights to Peter Mudde, Netherlands.